Seeing their colleagues and patients die was a horrifying shock, according to survivors of the deadly air raid on a hospital in Afghanistan. 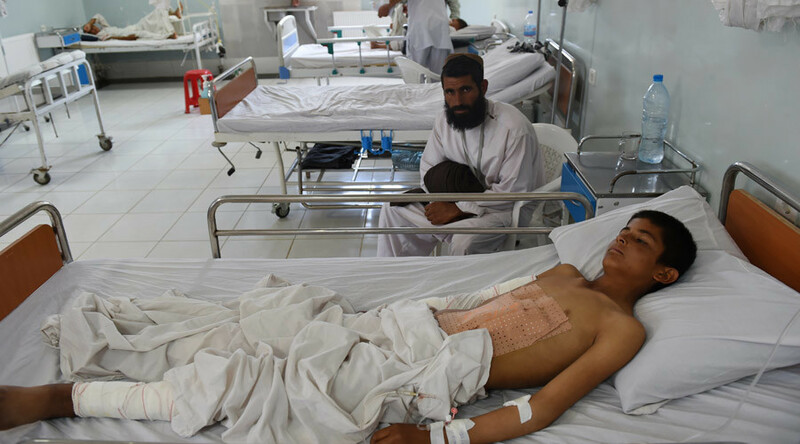 The tragedy, medical staff said, simply cannot be dismissed as “collateral damage” from a botched airstrike. The aerial bombing raids took place between 2:08am and 3:15am local time and were carried out at approximately 15 minute intervals, with the main hospital building being “repeatedly hit very precisely” during each raid, MSF said. The tragedy happened despite the fact that MSF had provided the US-led command with the GPS coordinates of the hospital to make sure that the hospital would not be hit. Zoltan remembers seeing one of the emergency room nurses sustain massive trauma to his arm. “He was covered in blood, with wounds all over his body. At that point my brain just couldn't understand what was happening. For a second I was just stood still, shocked,” Zoltan said. When the bombing stopped, some of the survivors left their shelters looking for those who could possibly have remained alive. Others, in a panic, tried to escape to safety, as the main hospital building was engulfed in flames. “We tried to take a look into one of the burning buildings. I cannot describe what was inside. There are no words for how terrible it was,” Zoltan said. “In the intensive care unit six patients were burning in their beds,” he added. “Those people that could, had moved quickly to the building’s two bunkers to seek safety. But patients who were unable to escape burned to death as they lay in their beds,” Nagarathnam remembers. One patient was left in the operating room on the table “dead, in the middle of the destruction,” the nurse recalled. Eltaf Najafizada, a freelance journalist for RT, found out about the death of his friend Aminullah Salarzai on social media. He had worked at the hospital as a doctor. The charity has confirmed 19 deaths, 12 of whom were staff. Four were adult patients, along with three children. A further 37 were left wounded. At the time of the bombing, 105 patients, and more than 80 MSF international and national staff were in the hospital.